Legendary Notre Dame (Notre Dame de Paris), sung by Victor Hugo in his novel of the same name, located in the IV district of the French capital, in the eastern part of the Ile de la Cite. He is the geographical center of not only Paris, but all France: the square in front of the cathedral is a bronze ring, which serves as a reference for the zero kilometers of road distances in the country. Construction of the cathedral began under Louis VII of France, in 1163, on the site of the first Christian church in Paris - St. Stephen's Basilica. The construction of about 170 years, and to work on the project the church had more than a dozen architects, including the famous Frenchmen - Jean de Chelles and Pierre de Montreuil. Long building and change of architects reflected in the external appearance of the temple - it combines elements of early and late Gothic with a Romanesque style. 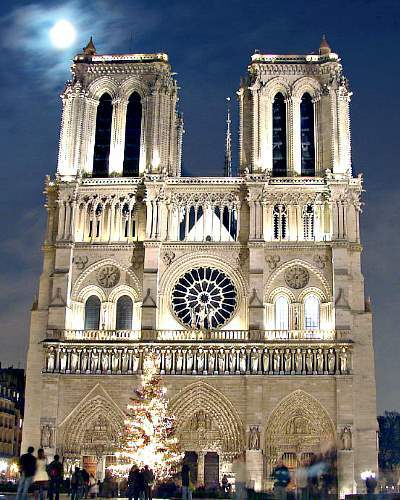 Notre Dame is interesting not only as an architectural masterpiece, but also as a place where the wedding of Marguerite de Valois to Henry of Navarre and crowned Napoleon Bonaparte. In addition, it houses one of the greatest relics of Christianity - Jesus Christ Crown of Thorns and nail from the cross on which he was crucified. Among the other attractions of the cathedral - the largest in France, a body composed of 111 registers and 8000 pipes, chimeras and gargoyles that adorn the facade of the cathedral, the gallery of the Kings and many drugoeKnigu Guinness World Records as having the greatest success in the first year of operation. In the original version of the musical toured Belgium, France, Canada and Sweden. The French theater "Mogador" in 2000 made his debut as a musical one, but with some changes. These changes adhered to the Italian, Russian, Spanish and some other version of the musical. In the same year it launched a shortened version of the American musical in Las Vegas, and the English version in London. In the English version almost all the roles were played by the same actors as in the original.